Jack Daniel’s Racing will be forced to switch Rick Kelly to a spare chassis for the ITM Hamilton 400 in New Zealand on April 15-17. Kelly’s #15 Jack Daniel’s Commodore sustained significant damage in a crash on the opening lap of Race 3 at the Albert Park 400 in Melbourne last weekend. While initially the team was confident that the damage could be repaired before the New Zealand leg of the 2011 V8 Supercars Championship, more detailed inspection back at Kelly Racing’s headquarters on the team’s chassis jig has revealed significant damage. 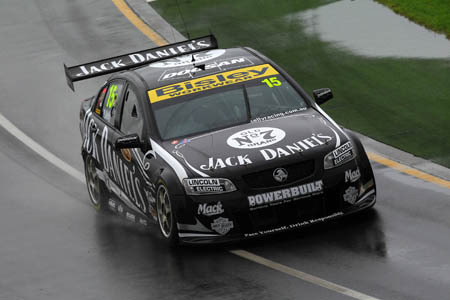 Kelly will now use Chassis PE047 in Hamilton, the car last raced at the #16 Stratco Commodore at the Sydney Telstra 500 in December 2010 and the same chassis that Todd Kelly drove to a race victory for Jack Daniel’s Racing in 2008 at Symmons Plains in Tasmania. It is expected that Kelly will be back behind the wheel of Chassis KR-02, the car he debuted at the start of this season in Abu Dhabi and was heavily damaged at Albert Park, for the fifth event of the season at Winton Motor Raceway on May 20-22. “I did a training session this morning in the gym at Kelly Racing, which overlooks the fabrication shop,” said Rick Kelly. “Looking down there at my car sitting on the chassis jig, it was strange to think that one weekend that car was second at the Clipsal 500 and the next it’s basically cut in half down the middle. “That chassis is called KR-02, but the ‘fabbies’ are now saying it will be called KR-02.5 because a lot of the left side needs to be cut away and replaced. “The damage is a lot worse than we first thought. It’s going to be a big job to fix it but we will take the time to do it properly and get it back to 100 percent. “It’s disappointing because we spent last season building that car and it was a bit of a showpiece for us. Now it’s a pile of metal. “But that’s what happens out there. It’s tight racing and cars are always going to get damaged. There is no point worrying about it. We just have to put our heads down, use the spare chassis in New Zealand and get on with the job. “We’ve moved from 18th to eighth in the championship in one event in Adelaide and we were unlucky not to be third on the Saturday at Clipsal. “The spare chassis certainly isn’t going to hold us back. New Zealand is a great opportunity for us to prove that. David Reynolds also suffered damage in the same crash at the Albert Park Grand Prix Circuit, but the #16 Stratco Commodore (Kelly Racing Chassis PE048) will be repaired in time for the ITM Hamilton 400.